Geistliches Lustgaertlein (hortulus animae), a very popular title for devotional books ever since the Middle Ages, the idea being that the soul or the mind ambles in a lovely flower garden while reading the prayers and devout meditations of such a book. The number of books with this or similar titles is fairly large, both of Catholic and Protestant origin. Particularly during the period of Pietism this type of devotional literature became exceedingly well liked, the most outstanding example of it being the hymnal of Gerhard Tersteegen, Das geistliche Blumengärtlein inniger Seelen of 1729, with many reprints both in Europe and in Pennsylvania. Among Mennonites two books of this or related title are known and once were much in use: (a) Johann Philip Schabalie, Lusthoef des Gemoets, 1638, consisting originally of two parts, the second of which is the famous Biblical history, The Wandering Soul [first published separately in 1635]. The first part, a book of "spiritual exercises" (geestelijke oefleninge), was soon published also independently as the very Lusthoef itself, and passed through innumerable editions both in Dutch and in High German. It proved to be a really popular religious reader of high value, with all its wealth of edification, information, and imagination. However, no North American edition is known. (b) Perhaps still more popular was another devotional book of this title, Neu vermehrtes Lustgärtlein frommer Seelen, das ist heilsame Anweisungen and Regeln zu einem gottseligen Leben, ... first edition 1787. No author is named, and the origin of the book is rather obscure though it may be safely assumed that it is of non-Mennonite (possibly Lutheran) origin. No reference to this book could be found anywhere; and yet it is one of the most successful devotional books among European and American Mennonites (particularly among the Amish). It had at least fifteen editions in Europe between 1787 and 1877, and twenty or more editions in North America; the most recent as late as 1997. The first part of the Lustgärtlein (i.e., Heilsame Anweisungen, etc.) appeared, as far as research could ascertain, first as an appendix to the Ernsthafte Christenpflicht, the well-known Mennonite prayer book, in Herborn, Nassau. A chart with a complete survey of all editions may be found in Friedmann, Mennonite Piety, 212, demonstrating the tremendous appeal of this book, in spite of its otherwise surprising obscurity. It is quite uncertain whether the book is found in any European collection of devotional books (inquiries in the 1950s were negative) ; on the other hand Goshen College Library has a great number of well-worn copies, collected from Mennonite and Amish homes. The book is divided into two unequal parts: (a) a collection of rules and counsel for the conduct of a pious life "agreeable to God," and (b) a collection of prayers for everyday and for holidays, also an extensive formulary for the Lord's Supper. The appropriateness of these prayers and counsel (for which the "Book of Proverbs" is quite frequently quoted) for many occasions, or just for general edification, may explain why this strange book became so unusually popular among Mennonites in spite of the fact that certain passages (e.g., concerning infant baptism) run directly counter to Mennonite tradition. 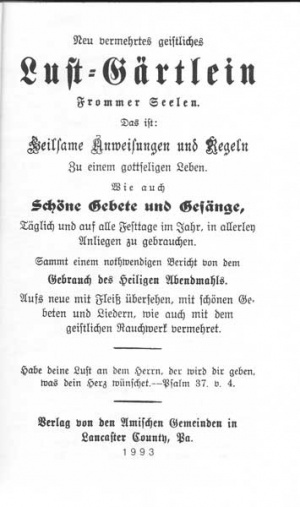 Today the book is still in use among the Amish, and it might even be conjectured that there were Amish groups in Hessen and Waldeck which originally adopted this book for their use, although also Mennonites in the Emmental (Switzerland) and in Bavaria soon became fond of it. The fact that the oldest known edition bears the title, Neu vermehrtes . . . Lustgartlein, seems to indicate that an earlier (thus far unknown) edition existed, presumably of 1750-70, which was later enlarged and published prior to the Mennonite edition of 1787. The entire tone of the book is extremely pietistic, emphasizing thoughts on death and dying, typical of 18th-century devotion. Beck, Hermann. Die Erbauungsliteratur der Evangelischen Kirche Deutschlands. Erlangen, 1883. Beck, Hermann. Die religiose Volksliteratur der Evangelischen Kirche Deutschlands. Gotha, 1891. Friedmann, Robert. Mennonite Piety Through the Centuries. Goshen, IN: Mennonite Historical Society, 1949: See index. Friedmann, Robert. "Geistliches Lustgärtlein." Global Anabaptist Mennonite Encyclopedia Online. 1956. Web. 25 Apr 2019. http://gameo.org/index.php?title=Geistliches_Lustg%C3%A4rtlein&oldid=91867. Friedmann, Robert. (1956). Geistliches Lustgärtlein. Global Anabaptist Mennonite Encyclopedia Online. Retrieved 25 April 2019, from http://gameo.org/index.php?title=Geistliches_Lustg%C3%A4rtlein&oldid=91867. Adapted by permission of Herald Press, Harrisonburg, Virginia, from Mennonite Encyclopedia, Vol. 2, pp. 447-448. All rights reserved. This page was last modified on 23 August 2013, at 14:02.